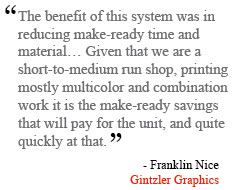 A flat bed in-line hot foil embossing unit requires a series of functions and high performance in order to be able to used successfully in-line. The rotating foil head enables innovative, multiple colour designs to be produced directly in-line in one cycle. With qTool® (pat. pend), Pantec RHINO™ offers the fastest tool changing. The Pantec RHINO™ tool cassette immovably holds male molds and stencils while remaining universally adjustable. Not even rotary printing machines get around the use of a flat hot foil embosser when difficult surfaces have to be embossed with hot foil. The integration concept of Pantec RHINO™ is proven in in-line application in rotary machinery. A separate web tension station uncouples Pantec RHINO™ from the printing press. The robust mechanics of Pantec RHINO™ enables web speeds of up to 120 m/min. The integration of the flat embossing unit into the printing machine is now possible with suitable foil and substrate without losses in productivity and a multitude of advantages are accessible! The Pantec RHINO™ has all the necessary functionality to achieve perfect embossing results: flat bed hot foil embossing for rough papers and high relief depths; adjustable, precise processing time independent of the production speed well as a robust design with a 2-eccentric shaft for the hub, which ensure uniform embossing pressure under extreme conditions. Copyright © Innovative Printing Technologies Inc. | Sarasota, Florida 34240 | All Rights Reserved.